I am so impressed with social media, I mean thoroughly impressed! However, as things change and companies/brands turn social media into a money making machine there are aspects that are lost. For instance, we see here that our activity on Instagram is collected so that ‘people’ can see when we’ve “interacted with an ad the same way” you would on a friends post. Hmmm… think about that for a moment. THEN we see that different kinds of information from your personal device is collected, “like how you tap and scroll”… hold up… how I tap and scroll? I’m going to shake like a leaf as much as I can from now on. Gotta throw things off here! #StickItToTheMan right? Maybe it won’t actually work that way. In any case, we read later on that more information is collected from our activity and THEIR PARTNERS!? WHO. IS. THAT!? It’s all shared with “the Facebook Companies” to “personalize your experience, including ads”. But I don’t want ads…ever. NO ADS! PS – click on the ads here on my blog/vlog & social channels so I can make money to eat. Moving on, they also will “use and share information for research” and provide a friendly ‘ways to “keep our community safe on Instagram”. They also forget to mention that there’s data that is used to categorize each account or ‘pigeonhole’ each of us into a category. Finally though, there is something that really peaked my interest near the end. It’s the sentence that says, “includes information about facial recognition”. What details are being captured by my camera and being sent to who? I need to research this some more. I’ve highlighted those things that seemed most interesting to me, that I need to check out in greater detail… when I have more time… whenever that will be! Please understand, I am not ‘picking’ on Instagram or Facebook, I’m sure the same things are going on with Google/Alphabet, Apple and Microsoft. Perhaps I’ll share some opinion on those at some point as well, just maybe. Well, we’ve arrived in LA, California! What a long day of travel yesterday. Early wake up for everyone… we started the day at 3:30 in the morning, which wasn’t all that bad actually. I mean, we’re going to Disneyland, right? The flight from our Okanagan Valley to Vancouver was on a prop plane that wasn’t very full. There were enough people on board that we couldn’t each have our own seat but, as a family, we sat together which was nice. But from Vancouver to LAX was another story! The flight company we used (Ai r Can ada) over sold their flight so they were asking for 4 or 5 people to take another flight that routed through Denver and got you to LAX at 6:45 PM instead of 2 PM. They also offered $400 a person travel credit which turned into $800 cash per person when they could only find 2 takers. In any case, we eventually got onto our plane (which, of course, was SUPER full) and ended up sitting in 2 rows of three rather than a group of six. Not the best seating arrangement but definitely not the worst. Once in LAX we got off our plane, ran into an old acquaintance from high school, and proceeded to the baggage claim. Oddly enough, we started down an escalator and into a long windowless (and ad/poster free) tunnel. We were joined by two pilots and no one else! Where had we ended up? I asked the two pilots who said we’d found a little-known hall to get to the baggage claim that not many people (except for pilots) use. This was a great find as we literally walked right out of the tunnel and up to the luggage carousel which had spit out our luggage almost immediately when we got there. Because of this sneaky tunnel, we saw very few people and didn’t see any celebrities (nor were we recognized as the celebrities we are! J *wink*). After our first brief wait in line in LA, we were onto a SuperBlue Shuttle and off to our hotel! In true Los Angeles style, the road was packed, bumper to bumper. Our driver was good, weaving in and out of traffic to get to our destination in a timely fashion. We even drove by a three car accident. Upon arrival at the hotel, we checked in and listened to the “welcome” message from the host/concierge and went up to our room… which wasn’t ready yet. The door was propped open and there were some dirty dishes and a clipboard on the counter. I left my family there in the hall and headed back down to the front counter to inquire about the situation with the room and we were promptly moved to another room with an apology. The room is nice, a very good size for a family of four however for a family of six, a little tight but it turned out to work just fine. Everyone had a bed to sleep in and we managed not too badly with only one bathroom (although we had to leave the shower/toilet unlocked so others could use it if needed during showers). All we really needed was a place to eat breakfast and sleep anyway. Remember, the trip is about family experience/memories rather than hotel stays! After we unpacked a little we decided eating food was in order so off we walked down the road to get some Subway although, before we could see a Subway we saw the Cheesecake Factory, which we promptly walked in and asked about the wait time. Amazingly enough, the lineup was super short and we made it to a table within 20 minutes. What a delicious meal we had that night, which was concluded with some amazing cheesecake (of course!). We had a slice of Oreo Dream Extreme and one Chocolate mousse (which had our eldest daughters name written on the plate with chocolate syrup because it was her birthday. It was time to get an Uber for some groceries! We hit up Vons and filled up on the basics. AND, of course, Henry Wienhards root beer, have you had this stuff? Best root beer on the planet! No lies! No packing yet but much discussion about the variety of activities we’ll want to do… and there are ALOT of them. I’m a little concerned that I’ll turn into a drill sergeant and demand that we hurry to the next event/activity and miss out on enjoying the moment… knowing this I hope to be diligent and NOT be “that guy”… I’ll let you know how that works out! Well, we’re on the countdown… I’ve been doing all kinds of research on what we should do while we’re in LA. Of course, the whole reason we’re going is for DISNEYLAND and CALIFORNIA ADVENTURE PARK! AWW YES!! Mousesaver.com has LOTS of great tips and suggestions along with discounted prices (I think they’re discounted anyway). BUT I decided that since this is LITERALLY a once in a lifetime trip for my family (big family and all) we’ll get shirts to commemorate the event! And we’ll need a new camera, of course! Can’t take “mediocre” photos on a 6 year old camera can we? No way! Memories are worth more than that! More info to come on each of these as plans start to solidify! Alright, so it’s been quite a while since I’ve posted anything on the blog… life has been busy. This update starts with the announcement that I’m taking my family to Disneyland! For real! I’m pretty stoked, it’s been several years in the making. I think what’s really got me excited are my kids! I’ve been really hush, hush about my family (privacy & all) but a couple of my kids have expressed interest in the YouTube lifestyle that I’ve been nurturing with a couple YouTube channels (SpaceLuke & The Bros in the Know[BitK]) since 2011. I think I’ve got some stellar potential for a Daddy blog. With four daughters of my own (now aged 7-13) I have experienced much… and continue to experience more! I’ve been an Elite Yelper for 3 years now and really quite enjoy that aspect of travel. I’m looking forward to more pictures, video & providing reviews! Now Rick, the other co-founder of The BitK, has 5 sons… between the two of us, there isn’t much that we don’t have an opinion about or haven’t experienced. With that being said, it is now time to share with the world what we know, starting with #Disneyland! The catch? Well, it’s not until the end of summer time so I can’t tell you much before then, although I’m happy to share the “planning” stages of my trip. 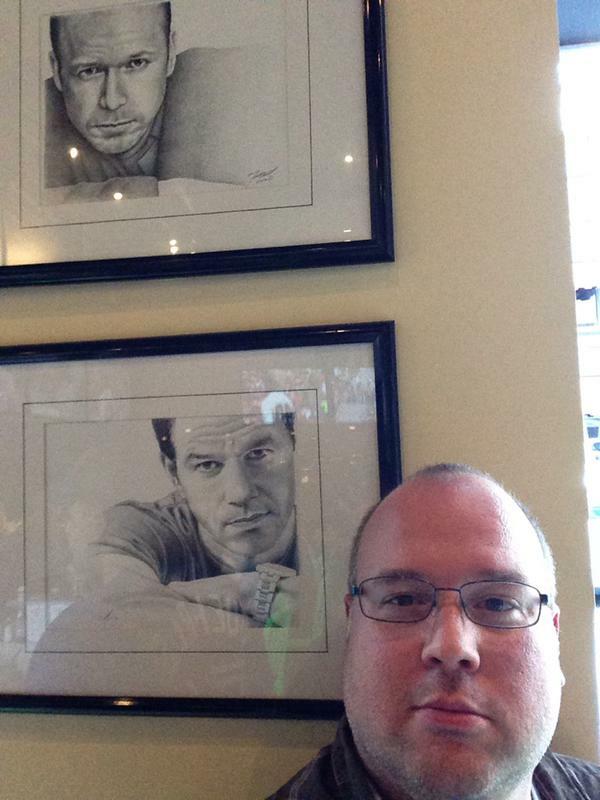 However, Rick had an opportunity to head to Disneyland just a couple years ago… it’s time for him to share his story! Starflight – What was Starflight? “A computer game for the IBM PC developed by Binary Systems which started development in 1983, and was released in 1986 “after 15 man years” (which really is 3 years for 5 people or 1 year for 15 people) for the cutting edge video technologies of the time, namely black-and-white, Hercules monochrome, composite TV, 4-color CGA, and 16 color Tandy graphics. Later a second version was released with EGA graphics support and versions were ported to the C64, Amiga, Atari ST and the Sega Genesis platforms! Starflight was a classic spaceship adventure game from the 1980’s it took years of development to build a system that generated a procedural universe with fractal planets. You had to manage your crew, gather resources upgrade your ship and many other things, but in all the procedural content there was an actual story with a threat to the galaxy, alien races vying for supremacy or allying themselves for protection. So, what was so great about it? A couple things, the first was the fact that you could land on any planet (you would choose your landing spot from orbit also). Then you’d take your little ATV out and find precious metals and/or alien artifacts. You’d bring those back to your ship (make sure you had enough fuel to do the round trip back to your ship), then sell them at the nearest space port for profit. In this same space port you could hire personnel, either Humans (Arthlings), Thryn (Kangaroo like), Elowan (Plant forms), Velox (insect) or Androids (robots). Once your ship was full of crew, you could fly around space to various planets. You’d approach the planet, enter orbit, choose a landing zone (based on terrain & atmosphere) and then send out the ATV to gather resources! This was one of my favourite things in the game. You would be able to setup your ship with higher class weaponry, armour, engines and more! Now, while you’re out flying about from planet to planet you can bump into a variety of races, both passive & aggressive. Great game! I really hope StarSector turns out to be the next StarFlight! If you’d like to know more about StarFlight, this link has some really great detail! 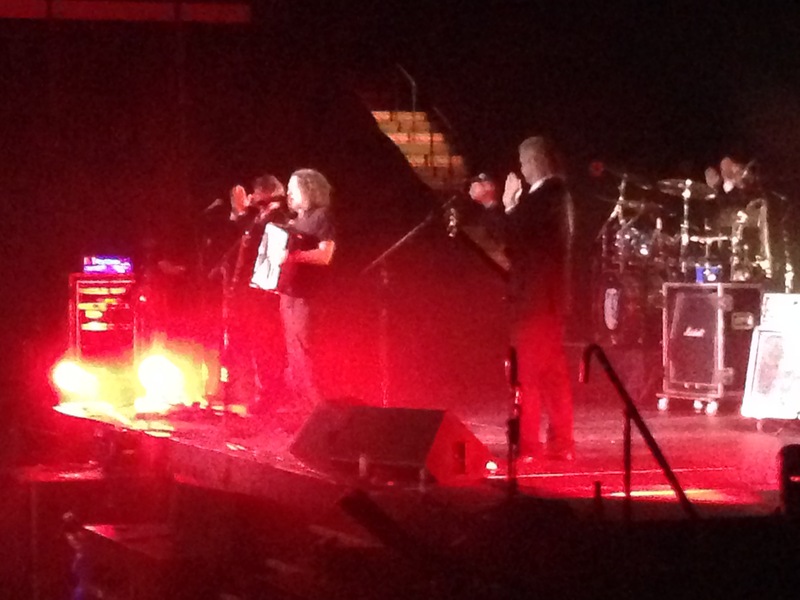 I had the opportunity to go to a Weird Al concert in Penticton. What a show! This man is truly an artist, a musical entertainer! It was incredibly impressive the way he sang and danced with his band (who are all original members, which says alot about his character & personality). He’s somewhat older than me (19 years-ish older actually) but man is he flexible, he was high kicking to almost eye level! Impressive show. Another impressive tidbit about the concert was the HUGE demographic of the fans. The audience was filled with men and women of all ages, from 5 years old to 60 years old! Single folks, folks on dates, basement dweller style folks and even those you’d expect to be business savvy folks! Amazing!! So here’s how the night starts out. My buddy and I hit up the local Triple O for a burger. While we’re ordering we ask the gal running the register, what her favorite burger is, she says, “Oh I’m a vegetarian so I don’t eat any of them. But the jalapeno chipotle BBQ one is a big seller!”. Well, kudos to her for getting a job done, if you need some income, you gotta make sacrifices. And I think it’s great that she didn’t let her personal choices get in the way of serving others. For the record, the burger was quite good! After our delicious dinner, we went to the concert hall. What was cool is that we were one of the first folks that got to enter the center. We found our seats and sat for a few minutes. 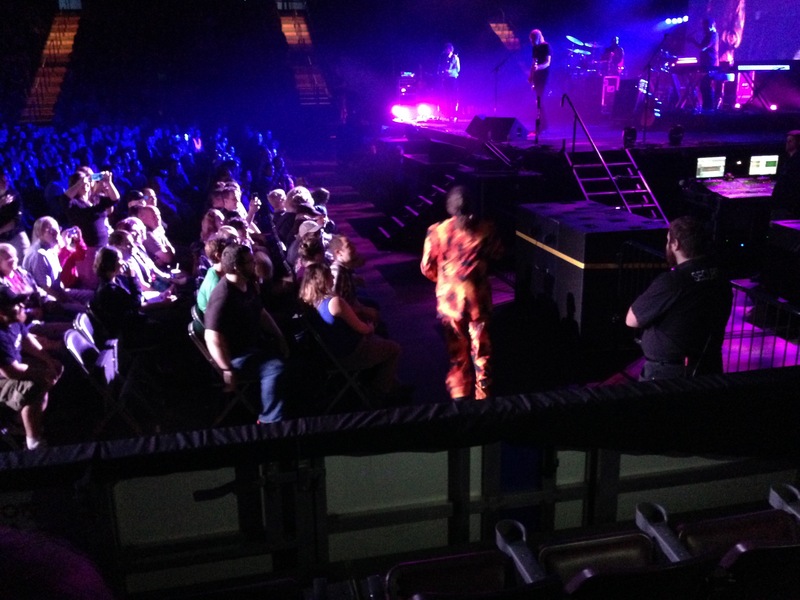 We figured it was boring to sit for almost an hour so we wandered the halls looking for a glimpse of Weird Al himself! We saw his personal tour bus and some trailers out back, in fact we met Greg, one of the transport drivers (there were 4 semi trailers full of equipment for the show), a couple security guards (I didn’t catch their names) and then we met Joel, the video lighting guy! He was really cool! A great kid with a sweet gig. 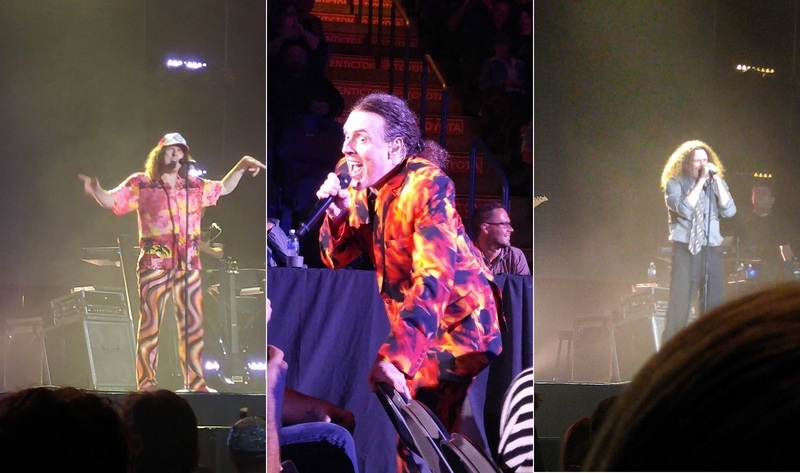 He confirmed our suspicions that Weird Al is one stand up guy! While we wandered around, we didn’t get to see him, but we did get kicked out of a hallway that was just outside the “VIP Experience”. You could hear the weird al music playing and people talking. Speaking of the VIP experience, it was comical to see a couple of the purchasers of the VIP package. They were EXACTLY what you’d expect to be the stereotipycal “over-the-top” fans. Picture one in your head… put that description into the comments below! Please? DO IT, DO IT NOW! SPOILER: If you don’t want to know what the fans looked like, skip this paragraph. YOU’VE BEEN WARNED! The fans we saw (which may not be a fair representation of all fans) were greasy, long haired and ponytailed down to their belt line, slight BO and incredibly socially awkward! Some even worn foil hats and were fancied up in tie dye shirts and other tacky clothing. For the record, my friend and I are NOT vip holders…definitely not. Throughout the concert he has 12 costume changes! TWELVE!! Pretty amazing actually, in between each of the songs (during the costume change) there would be video clips up on the screen. They had some comical shorts, lots of interviews from ALTV and pretty much any pop culture reference from every cartoon you could think of (The Simpsons, Family Guy, Futurama, robot chicken, you name it!). One highlight of the evening was when he turned his back to the audience and from a box by the drum set he lifted high… his accordian! The crowd went berserk! I’m not sure I’ve ever heard an audience explode into cheers and screams like that! 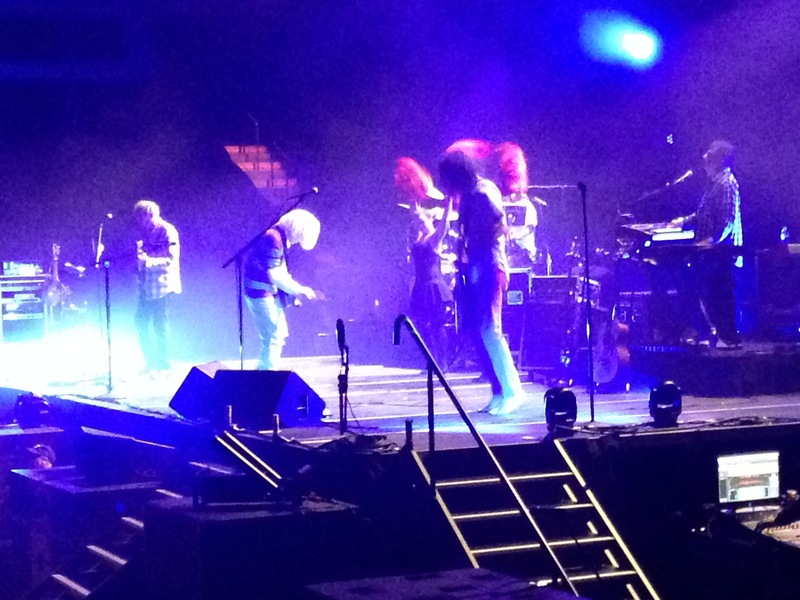 Weird Al broke into “Another one rides the bus” and it was glorious! The drummer made all the great, expected duck quacks, whistles and horn toots throughout the song. Al’s really good on that accordian. Yup, we’re on a first name basis now. Another highlight was when he had his gargle solo in “Smells like Nirvana”. You can’t really see it in the picture here but there’s a cup of water by the microphone. Of course, he picked it up, put some in his mouth and gargled like mad (not sure he actually did it there on stage, he might have been…gargle-syncing!). Then he spit it out over the crowd and took the cup and splashed the leftovers over the crowd then threw the cup. Someone is holding that cup thinking, “Weird Al’s lips touched this cup!!!”. Crazy fans. Once everything was done, it wasn’t really done. There was an incredibly long wait after Al left the stage, so long that a bunch of people left. Then…THEN… out came Darth Vader and four storm troopers! I was glad that they wrapped it up with “the Saga Begins” and “Yoda”. Great songs! Towards the end of the Yoda song, they burst into this epic vocalization portion where they all harmonized, said odd words/phrases and made an all around great rambling of notes that was well worth staying around for! Truly an epic conclusion! To wrap up the evening, there was a wild fluke of a situation at the end (although not really a fluke because we hung out for an hour and a half). There were 5 of us who hung around out back hoping to see Weird Al getting into his bus and maybe even and get a wave! Well, a security guard walks over and says to the other security guard, “how many of them?”. “Five”, said the other security guard. WHA-????????? FOR REALZ????? Ya, totally. I was first in line! I brought Weird Al’s ‘running with scissors’ album for him to sign JUST IN CASE I bumped into him in the bathroom or whatever (not awkward at all, I’m sure). Anyway, I didn’t know where to get him to sign! I asked the security guard guy where I should get him to sign it. He said he didn’t know and didn’t care. I asked him why he was making this complicated on me! he laughed and said you’re making this complicated! Get out of the line! Crud. What have I done. What a wild couple of years it has been! Lots of fun, hard work, growth and education! This is the closing of a chapter in my life, and a new one being started. I got to be in Toronto for a week in July and it just so happened to be during the pan am games. What a place! The municipal underground parking wasn’t too bad, only $6 per half hour… sarcasm doesn’t translate well through text. Anyway I found my way up a set of stairs out of the underground parking garage and popped up in the Nathan Phillips Square (NPS) where there was a PAN AM concert going on. This place was hopping! “What have I got myself into? !”, I thought. I heard that the Eaton’s Center was one of those places that you should see if you’re in Toronto, so off I went through the park and down the road to find it! LOTS of stores in the three story high (1 or 2 underground) shopping center. When I finished checking out the variety of shop locations and had some great food court chinese food (it really wasn’t that bad), I exited the underground onto a street to continue my exploration. As I strolled around, I pulled out the touristy map that I grabbed from a tent at the NPS Pan Am festivities and saw a large yellow line that said “Yonge Street”. It looked like it looped around so I figured that I’ll just keep walking and end up back at NPS, right? A few steps later, on the sidewalk itself is written in metal “you’re on yonge street, the longest street in the world.” Well, the idea of ‘just loop around’ turned into a very bad idea at that moment. While getting lost in Toronto (er…exploring), around the next corner, in fact, I was asked by some young folks with broken English as to where city hall was. I also was looking for city hall and told them “It’s this way… I think. Follow me!”. Off we went towards our shared destination. Turns out it was 5 kids on a university tour of Canada! Two from Brazil and three from Russia. Nice kids, I didn’t catch all their names but it was great to meet them. They spoke English really well and were well mannered. I should have given each of them my business card! Drats! In any case we ended up back at NPS, waved our farewells and I headed back to the car. Sushi-Ya! This place was a hoot! Here’s a video of “speedy” (a sushi chef) serving up some beer with Saki shots and a blow torch!! Seriously great sushi! Fun staff who put up with us and served us well. There were a couple loud & slightly rowdy businessman from Texas at the bar but the restaurant is laid out well enough that they didn’t disturb my dining experience. I would highly recommend you go to Sushi-Ya in Toronto/Mississauga. The outside doesn’t look all that pretty but the inside is nicely decorated and food is delicious! I enjoyed a trip to the Ripley’s aquarium in downtown Toronto, there’s a lot to see there! If you walk slow enough you would be able to spend a whole day there enjoying the sights and sounds! 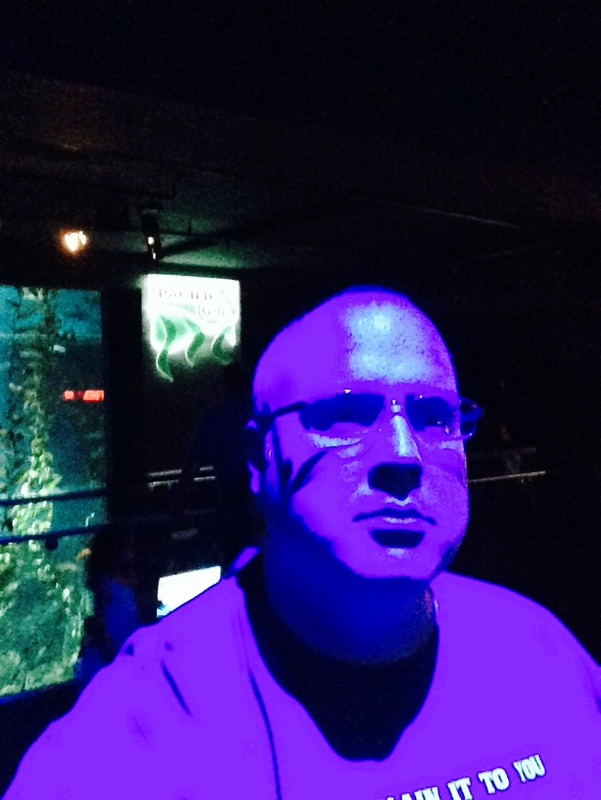 Below image shows my blue man group audition. It went well although they said I didn’t have the right body type. I joke! This is a neat blue light shining down from above at the aquarium! In the background of this picture is a two story high HUGE fish tank, loaded with Kelp and sea life! In the background there is a two story high HUGE tank. We had a great poutine at Smoke’s Poutinerie on Queensway also! There was a great gal working there who was going to school and this was her evening/weekend job. I hope she’ll forgive me, I can’t remember her name! She was awesome. Smokes Poutinerie was full of any style of poutine toppings you could imagine! Country Chicken style poutine (chicken pot pie filling), Italian poutine (italian pizza toppings), hogtown (pulled pork, bacon and sausage) and a philly cheese steak poutine (I bet you can figure out what toppings were on this one). I don’t know if it was that we were closer to Quebec then on the west coast but the poutines were awesomer than I have had before! 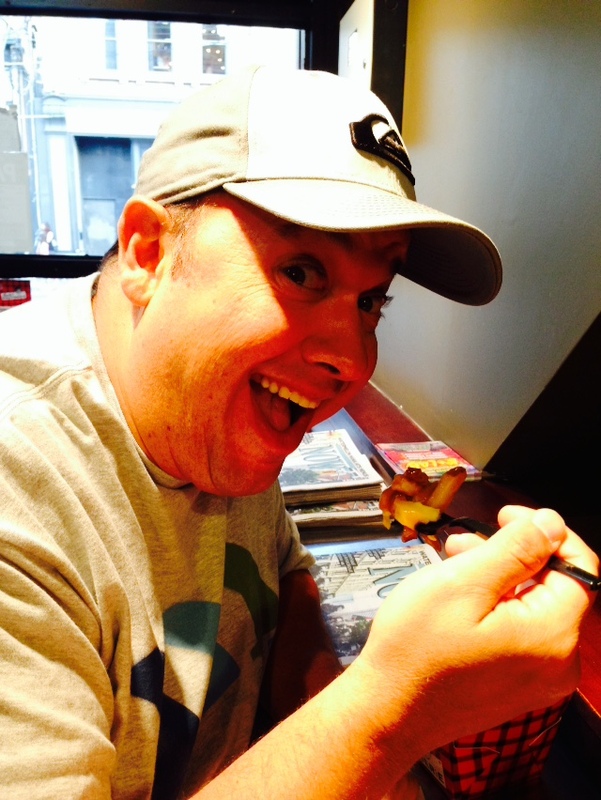 My American buddy having a poutine for his first time, he’s addicted now! We were in the poutinerie for about 40 minutes, we crossed the street to where the car was parked, I stood by the passenger door and some other guy walked up, got into the car and started it up. That’s not our car! Our rental car was gone! There was another blue toyota (like the one we were driving) parked in our spot! Luckily some college student guy rambled something to us about a car getting towed away about five minutes earlier. WHAT?! Well, that started a fun trip! Hail a cab, jump in, drive for 25 minutes to the towing yard, find out there were three unpaid parking tickets on the rental car!! Unbelievable! Well, it all worked out ok in the end… although I haven’t formally heard how the rental return went. I’ll have to ask my visiting `murican friend as it was his rental. Well, here I am again, I’ve returned to Toronto for my tours farewell week. One night we ate at Wahlbergers, another at The Medieval Times and one at the CN Tower. Wahlbergers was timed nicely, as we had just been seated and a Toronto Blue Jays game was just over. The line up WAS HUGE in no time. Great food though, and I was substantially full after eating (and I was hungry before sitting down). 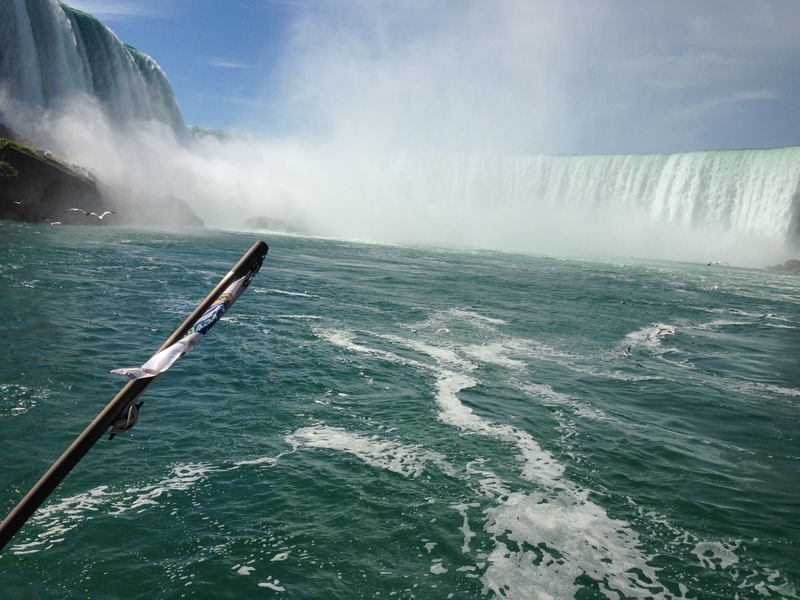 My last day in Ontario was spent at Niagara Falls, what an impressive place in this world to see. 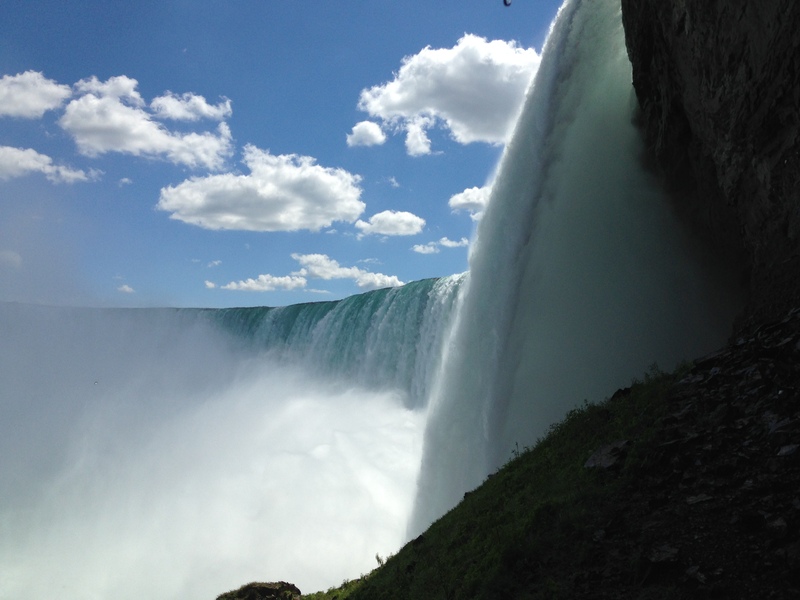 There are 6 million cubic ft. of water pouring over the crest of the falls every minute, EVERY MINUTE!!! 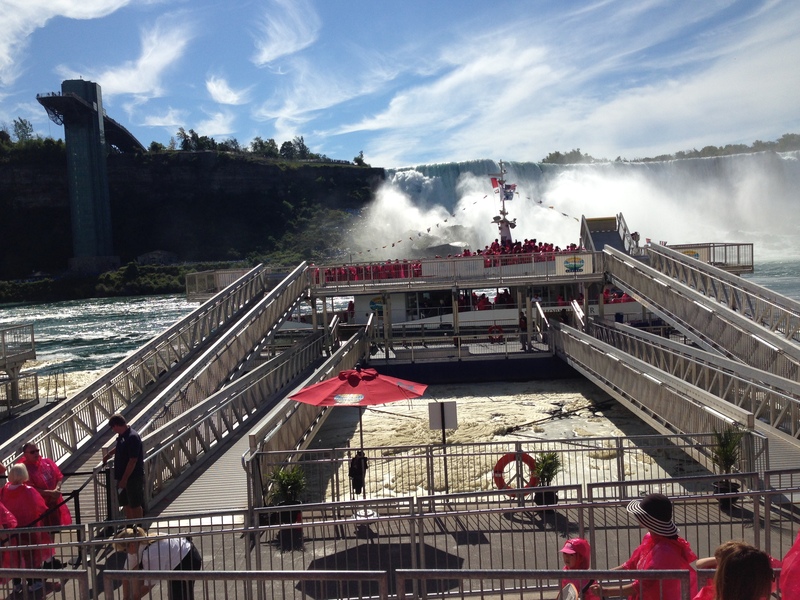 The HornBlower was worth every penny! It’s mighty impressive to be that close to that much water. I put away the phone because I pretty sure the spray would destroy my phone with water damage (and i would have been right)! The amount “drizzle” coming from the water falls made it hard to keep your eyes open. Side note, makes sure you buy an adventure pass, it’s the best value for sure. I’m bummed there wasn’t more about Nikola Tesla and was saddened to hear that the power generation station had been shut down in 1999 so you don’t get to see Mr. NIkola Tesla’s original AC Generators working. I hope they do up a museum in that building, it would be AMAZING I bet. Going behind the falls and through the tunnels was ok, The two spots where you end up behind the falls wasn’t as impressive as I thought it would be (might have been that I was already on the HornBlower in front of the falls though). The look out deck at the bottom of the falls (you enter this through the “behind the falls” experience) was really neat, I’ll give you that. The 4D movie experience was alright, kinda cool and at one point it really did feel like we were heading over the falls but you’re holding onto a railing so you know that your not moving…just your brain playing tricks on you. Over all it was a great experience and I hope to one day bring the kids! Dinner at the CN tower was kind of neat, the slow rotation was cool, I’d recommend going when there’s more day light, the nightline was cool, but the HUGE section of nothing over Lake Superior is boring in the dark… or frightening. It’s nothing but PURE darkness out there! This restaurant is always moving and rotates a full 360 degrees in 45 – 55 minutes. 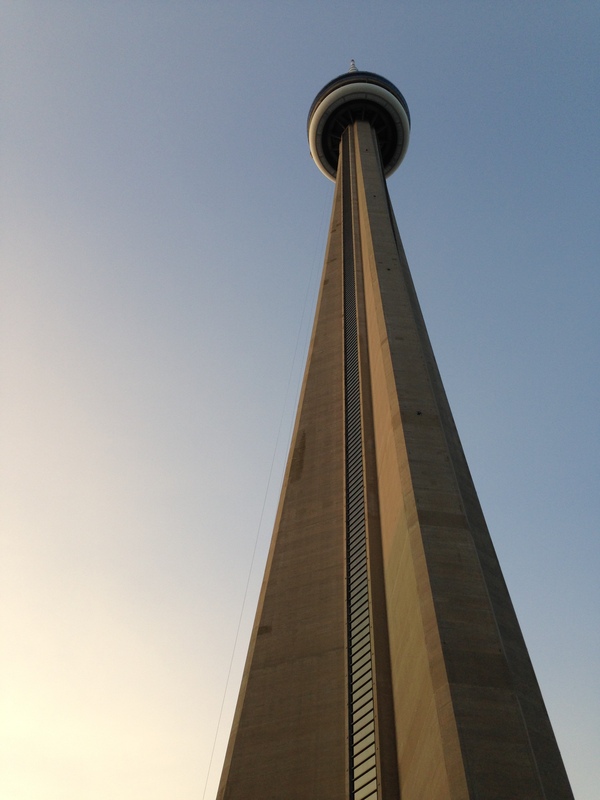 The CN Tower is SUPER tall (553 m [1814 ft]), and then standing on the glass floor is a MUST! The glass floor is 447 m (1,467 ft) high. A buddy of mine and I jumped on the glass floor as well, freaked out some of the other tourists (ok, I was a little worried the first time we jumped as well). We even got to see the Louis the 13th bottle of cognac! This hand blown crystal vessel with a 100 year old cognac in it! “It’s one century in a glass,” they say. This opaque black bottle retails for around $22,000 each! The bottle itself empty appears to be worth of upward of $8000 dollars. Along the lines of “rich taste”, I did get to have food grad gold flakes on my dessert. I’d be lying if I didn’t say I hesitated to eat it. I mean, it’s GOLD! I learned that gold doesn’t have any flavor and is fairly soft in this thin flake state. All in all, Toronto is a fun place. Glad I could spend a couple weeks here experiencing this central Canadian city!